Just back from engerland where I picked up my newly restored shell and to say that they did a top job is an understatment so now its trying to find a place for all the bits I stripped out of it over a year ago,should be fun.Its the first irish built car that somerford restored and they said that there were a few differences to the english built ones.I will post pics soon and now theres nothing stopping me from having it ready for the MTM Classic. Good luck with the car. What model Mk2 is it? Engine size etc? Great news , it took time but I am sure its worth it the wait , did they use my doors? bring on the photos. Wel,I thought that with the estate away to the spray painter it was time for an update on the MKII.The plan is to have it ready for the MTM so last week I started the reassembley and so far the wiring loom,headlights,indicators,fuse box,voltage regulator,door switches and 3 clock dash have been installed.By the end of the weekend I hope to have the rear lights,petrol tank and bumpers fitted and then started making up and fitting new petrol and brake pipes so that I can get the subframes on.The plan is to try and have it starting and stopping under its own power by March.More updates to follow soon. Well,Ive busy putting the MKII back together for the MTM and so far I,ve fitted both subframes and today I pumped up the hydro suspension.As you can see,its higher in the back by about 50mm so does anyone know a cure for this.Hopefully by mnday I,ll have all the systems bled and the engine starting. 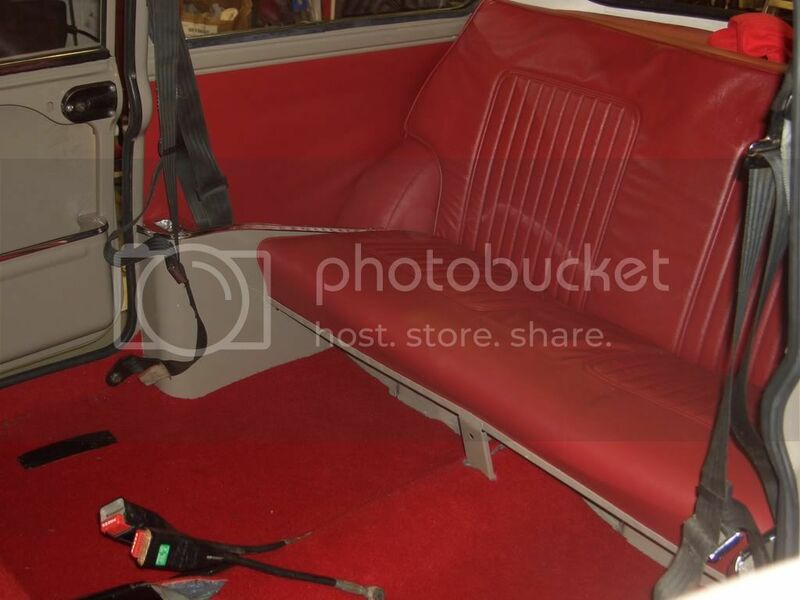 If the Marcos isn't ready, I'm sure TMG would offer to sit in the back! To be honest, neither of my hydros are dead level and they've been that way for years. Aidan, the Mk2 looks gorgeous. What colour is it? 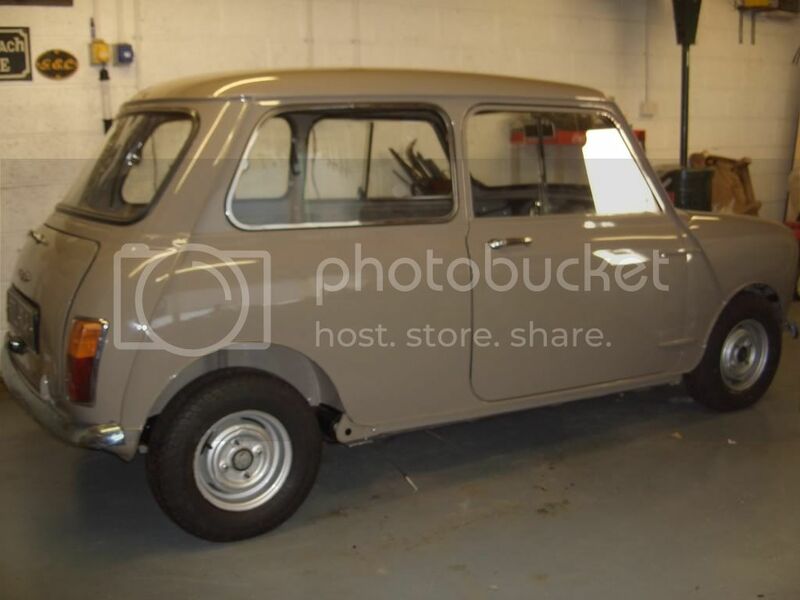 My '67 auto was a very very similar colour called Titian Beige which I don't think is listed for UK-built Mk1s. 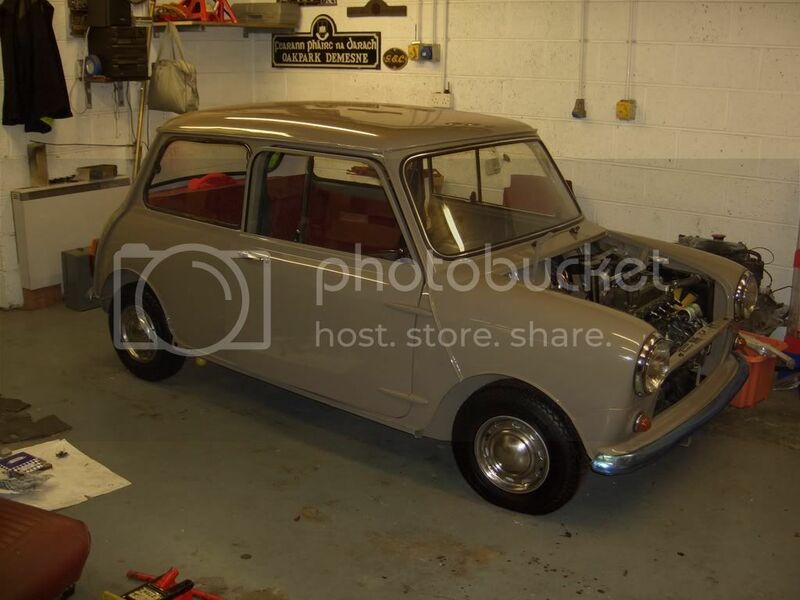 I had a look at old photos of it before the resto and it was always low in the front so now it has a couple of washers on the knuckles and hopefully when it,s been driven it will settle down a bit.The colour is an old BMC colour called "stone" that was never put on mini,s.It,s only slightly lighter in colour than the original.Hope to have it starting before tuesday. The workshop book I have shows the correct height from the centre of the wheel to the lip of the wheel arch directly above. Assuming yours is a later car. Front 12 5/8" +/- 1/4"
Rear 13 1/8" +/- 1/4"
After 4 years without turning it,s crank in anger the garage was filled with the sound of 848cc,s of power tonight.Roll on the MTM,now where did I put that back seat. What Minis have you? 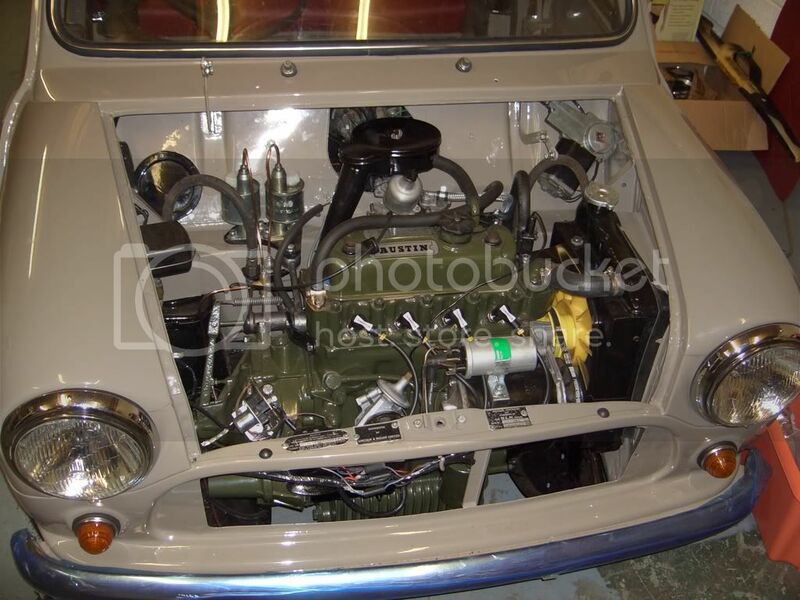 : Mk1 Austin Mini,Mk3 Layland Mini,72Van,81 Clubman Estate, 87 Race carand a 2000 Rover Cooper. Very well done KMG cant wate to see her at the MTM well done. Big box of goodies arrived from newton commercial today to sort out the interior of the MKII.The push is on to get it ready for the MTM,not much time left. 10" is enough for any man. car looks stunning.il be happy what ever day iget mine to look like that. . 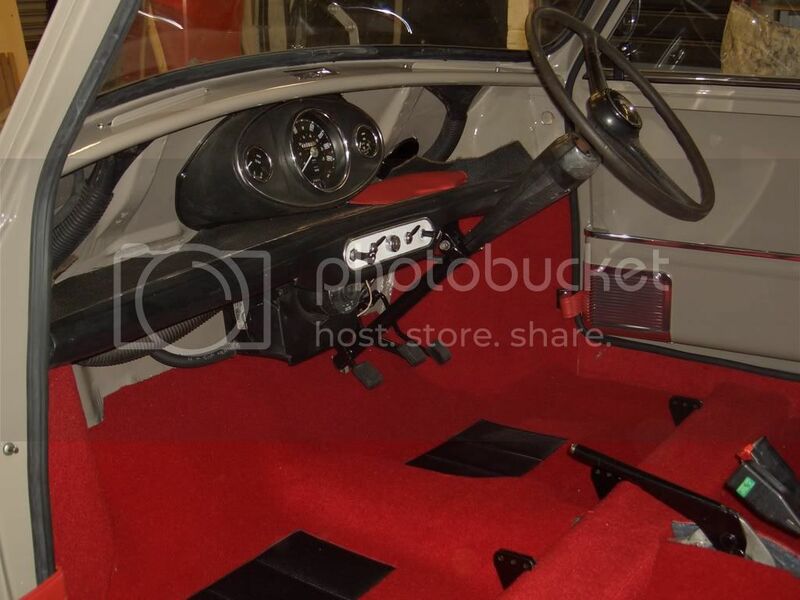 The race is on to get the MKII on the road for the MTM.The interior is nearly there and I have a list of things that need finishing but it,s looking good for the big event.Here,s a few pics.